We're back and eager to see what God is doing here in Germany. 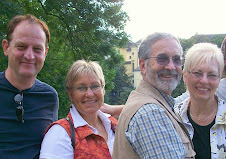 We arrived Tuesday and were again blessed to have Heidi's brother pick us up in Frankfurt. Blessed again, as we are staying with him and his wife in Erlenbach (about 1 hour east of Frankfurt) for the week and they are also blessing us with a vehicle. God is so good! The men have just left to do some visitation - God is opening doors for ministry - we just need to let Holy Spirit lead and be willing to follow. On the weekend, we head up north where we'll be headquartered for the next month. "God anointed Jesus of Nazareth with the Holy Spirit and with strength and ability and power; how He went about doing good and curing all who were harassed and oppressed by the power of the devil, for God was with Him . . . if anyone steadfastly believes in Me, he will himself be able to do the things that I do; and he will do even greater things than these, because I go to the Father." The question is: "Do we truly believe this?"